“Stanford researchers successfully manufactured high quality optical components using commercially available 3D printing materials. 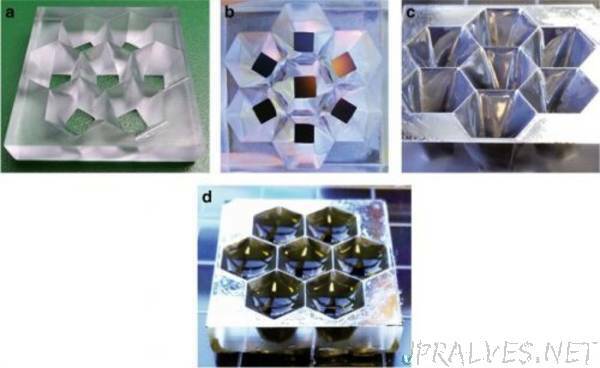 Researchers print optical surface (mirrors, arrays, lens molds), and coat it with a gel. Following curing, the optically smooth surface can be vacuum coated with Al and finished as a mirror or used directly as a mold. The method can be used to print mirrors, solar concentrators, lenses and optical elements of microscopes at a much lower cost. This gel smoothing technique can be used with commercial 3D printers (resolution of tens of microns) and the finished surfaces fabricated gave a rms (root mean square) surface roughness of around 2 nm. 3D printed optics were easy to fabricate, low cost, had design freedom and were also customizable, light weight, and low on material waste due to the additive nature of 3D printing.